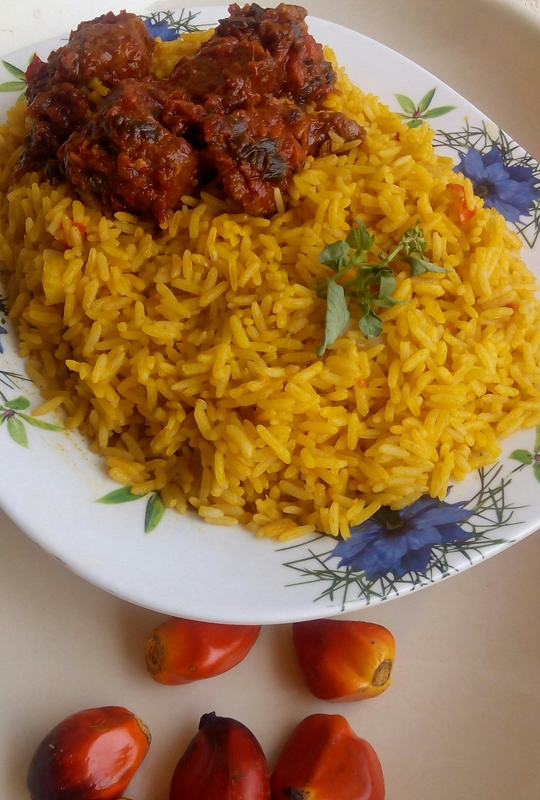 Need something different from your usual jellof rice… Try banga rice. 1 spoon cray fish (powder). -Set the pot of Palm fruit, add water and bring to boil on high heat, cook till soft or till you notice red puree on the top. -now pour into a mortar and pound to extract, separate the nut from the chaff. -add hot water and squeeze out the palm fruit concentrate sieve, allow to settle down. -after it has settle down pour the concentrate into a different pot and you will notice some black particles at the bottom, discard the black particles. N:B if you are using tinned palm fruit please skip this extraction procedure. -Set the palm fruits concentrate on gas/stove / and bring to boil. -pour the rice, atarodo, onion, cray fish, stock cubes and salt to taste into the pot of boiling palm fruit and cook till soft, add water if you feel the palm fruit concentrate will not be enough to cook the rice. -enjoy with sauce of choice or serve alone.